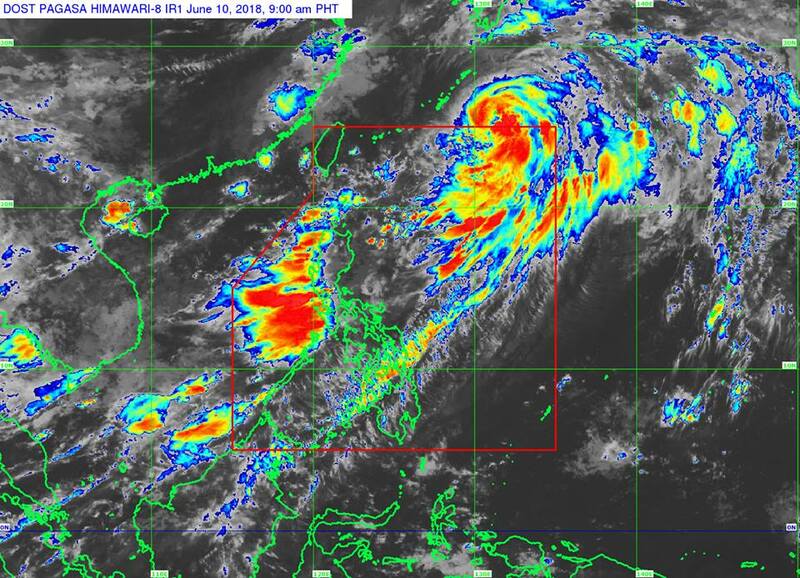 MANILA, Philippines – 'Bagyong Domeng' has intensified into a typhoon and is now outside the Philippine Area of Responsibility (PAR), state weather bureau PAGASA announced in its 9:30 bulletin on Sunday, June 10, 2018. Typhoon Domeng still affects Luzon as it enhances the Southwest Monsoon (Habagat), which brings monsoon rains especially over the western section, until early next week. "The public is advised to continue monitoring for updates, take appropriate actions against possible flooding and landslides, and coordinate with local disaster risk reduction and management offices," PAGASA said. At 9:00 am today, the eye of Typhoon Domeng was located based on all available data at 1,045 km East Northeast of Basco, Batanes (OUTSIDE PAR) (25.1°N, 130.8°E). 'Domeng' has maximum sustained winds of 120 kph near the center and gustiness of up to 145 kph. It is forecast to move Northeast at 37 kph. NOTE: No tropical cyclone warning signal raised. PAGASA added that sea travel remains risky over the northern and eastern seaboards of Northern Luzon, the seaboards of Central Luzon, and the western and southern seaboards of Southern Luzon.